Earlier this year the BBC screened a 3-part documentary entitled A Special Relationship, exploring the connections between Scotland and Northern Ireland. They were originally planning to do some filming in Stranraer, both at the RP church and the Football Club, but had to pull out a few weeks before due to scheduling conflicts. However a recent book, Preachers of the Covenants, does highlight many of the connections between the RP Churches in the two countries - including quite a few links to Stranraer in particular. David Houston, who 'firmly established the cause of Reformed Presbyterianism in Ulster', was born in Paisley in 1633 and educated at Glasgow University. William Martin, an Irish minister who emigrated with 460 families to America in 1772 was also a Glasgow University graduate, who completed his theological training in Dumfries. 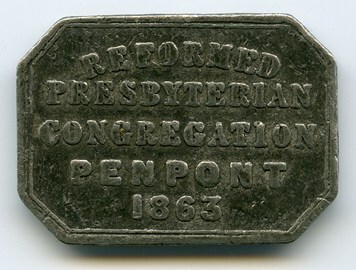 At this time Covenanters in Ireland were under the oversight of the Scottish Presbytery, who ordained Martin in 1757 - the first minister of the RP Church to be ordained in Ireland. Stewart Bates, the son-in-law and biographer of John Paul, who is quoted frequently in the chapter on his father-in-law, was born in Co. Londonderry, received a doctorate from Glasgow university, and served congregations in Kelso and Glasgow. Alexander McLeod Stavely was born near Cloughmills, graduated from Edinburgh university, and as was required of all ministry students at the time, studied for three terms at the Scottish Theological Hall in Paisley under Dr Andrew Symington (brother of Stranraer's most famous minister). J. A. Chancellor also studied under Symington in Paisley. Torrens Boyd was born in Ireland and ordained to Penpont near Dumfries. Some of his members walked 17 miles to get to church. He resisted calls for unity with other denominations which had begun to embrace liberalism, warning that such a union would be like chaining two ships together - when the waves begin to roll 'they will rasp each other's sides off, tear open each other's hearts and go down together'. The subsequent history of the churches in question would prove him right. A. C. Gregg was a Donegal man who served congregations in Loanhead (south of Edinburgh) and Greenock. He served the church through writing as well as preaching: editing the church's magazine, the Reformed Presbyterian Witness, and helping put together the biography of the famous J. P. Struthers of Whithorn and Greenock. F. S. Leahy, another Donegal man, studied at the Free Church College in Edinburgh and initialled ministered in the Irish Evangelical Church before his increasingly Presbyterian convictions led to him joining the RPCI. Part of the sermon A. C. Gregg preached at the ordination of Moffett Blair (twice minister of Stranraer, 1932-44 and 1969-78) is quoted. There is also a whole chapter devoted to Moffett's brother Hugh Blair, who began his ministry in Loanhead and served as edited of the R. P. Witness. He spent the majority of his ministry in Ballymoney and wrote the commentary on the book of Joshua in the New Bible Commentary. Willie Young (pictured below) who was minister of Stranraer from 1946-56 also gets a mention for the role he played in organising a convention of the Reformed Presbyterian Churches of Scotland, Ireland and North America, which was held in Scotland in 1938. There are also connections to Stranraer in the authors of some of the chapters. Tim Donachie (who contributed the chapter on David Houston) was the moderator of the RPCS when our current minister Stephen Steele was ordained, and preached the ordination sermon. Samuel Ferguson, whose biography of William Stavely is republished in the book, was minister of Stephen's home congregation of Faughan for 47 years. Sam Cromie baptised Stephen's wife Carla. Then Stephen himself has a chapter on Thomas Houston of Knockbracken. Preachers of the Covenants is available to buy from James Dickson Books in Kilsyth, or the Covenanter Bookshop in Belfast. Related audio: Sermons on Psalm 23 by Dr Hugh J. Blair.